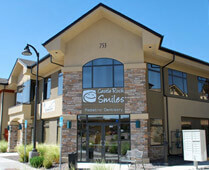 When Should They Visit the Children’s Dentist in Castle Rock? Despite many parents’ advice, your life has actually gotten much simpler after you’ve had a child. These days, whenever you think you’ve misplaced something, there’s a high likelihood that it’s in your child’s mouth. They’re obviously teething, and it has you thinking, “Is it time for them to go to the dentist?” This is a very common question, and your children’s dentist in Castle Rock, Dr. Layne Benzley, is going to answer it, and let you know what to expect on their first visit. When Should They Have Their First Visit? Logic would tell you that you should schedule your child’s first dentist appointment as soon as their first tooth appears, but that would actually be too soon. The American Dental Association recommends that your child should have their first dentist appointment 6 months after their first tooth has erupted, or by their first birthday. This means you don’t need to rush after they get their first tooth. If you bring them in too early, they simply won’t have enough dental structure for Dr. Benzley to examine. If your child doesn’t have any teeth by the time they turn 1, you should bring them in as well. 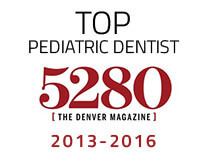 Your child’s first visit to their pediatric dentist in Castle Rock has much less to do with treatment than trying to make them feel comfortable in the office. These initial visits are very important to help your child establish a positive connection with going to the dentist, so it’s best to start slow. It will mostly involve a discussion between you, your child, and Dr. Benzley. You’ll talk about your child’s medical history, and any other observations you’ve made that might be relevant to their dental health. You’ll also discuss basic oral hygiene, why it’s important, how their diet affects their teeth, and developmental milestones you should look for. This will help you monitor your child’s growth, as well as get them thinking about taking care of their teeth. Dr. Benzely will perform a short exam on your child’s mouth and gums while you are holding them to check for any issues, and then advise you on what to do moving forward. Thankfully, these early visits can catch many problems while they are extremely easy to treat. After the first visit, you should bring your child in every 6 months for a standard check-up and cleaning, just like yourself. This will help their smile grow as they do, and keep them healthy for years. When it comes to treating your child, it’s all about a gentle touch, and they’ll get that from their first visit and all the ones after. 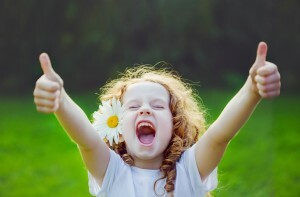 We want your child to grow healthy just like you do, and we’re happy to do our part in that. If you have any questions about bringing your child to the dentist or what to expect, please give us a call today.